Gretsch Model 6120 Chet Atkins Hollow Body Model Arch Top Hollow Body Electric Guitar (1957), made in Brooklyn, NY, serial # 23216, "Western Orange" lacquer finish, laminated maple body, maple neck with rosewood fingerboard, original white tolex hard shell case. The 1957 Gretsch 6120 is one of the most iconic of the decade's American guitars, with features transitioning from the full-out western appeal of the first Chet Atkins model to the sleeker '60's stylings. This guitar has the specific features of this year: two DeArmond Dynasonic pickups, a Bigsby with the stop built into the arm, hump-block fingerboard inlay and an aluminum bridge with a wooden base. The finish is a rare and unusually dark variant of the "Western Orange" seen particularly on guitars in this serial number batch. 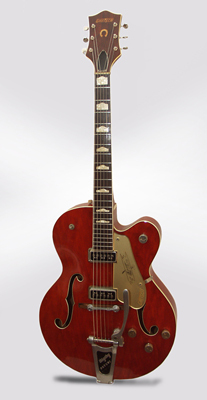 The specific model 6120 used by Duane Eddy on all of his early records had features nearly identical to this one; with a serial number only a couple of batches later, built perhaps a month or two later. This is easily one of the nicest Gretsch guitars we have ever had, with a sound and feel as good as they come! Overall length is 41 1/2 in. (105.4 cm. ), 15 3/4 in. (40 cm.) wide at lower bout, and 2 3/4 in. (7 cm.) in depth, measured at side of rim. Scale length is 24 1/2 in. (622 mm.). Width of nut is 1 11/16 in. (43 mm.). Very clean and all original condition-this guitar shows only minimal wear and checking, and nothing has been altered at all. The celluloid riser ring under the bridge pickup shows the beginnings of deterioration and has affected some of the plating on the hardware directly above it. No other issues, no binding deterioration, excellent neck angle, frets still have life in them-this is simply an exceptionally fine playing and sounding 6120 from one of the classic years, includes the original cowboy case with a bit more wear than the guitar. Overall Excellent Condition.